I’ve had some weird dreams in life (Paul Bodin scoring a hat-trick of penalties; us winning 5-0 in Nuremburg) but I never thought a Welsh under-21 side would restore my faith in the nation’s football. That’s almost too weird for words. After a dismal Saturday where many of the travelling horde questioned why they’d booked a trip to Kyiv, a bunch of callow youths chased, harried and battled the full 90 in the worst weather I’ve seen since Paul Wheeler won Cardiff City a League Cup tie at the Vetch in 80s. This was a supreme effort by our chaps in a magnificent setting. 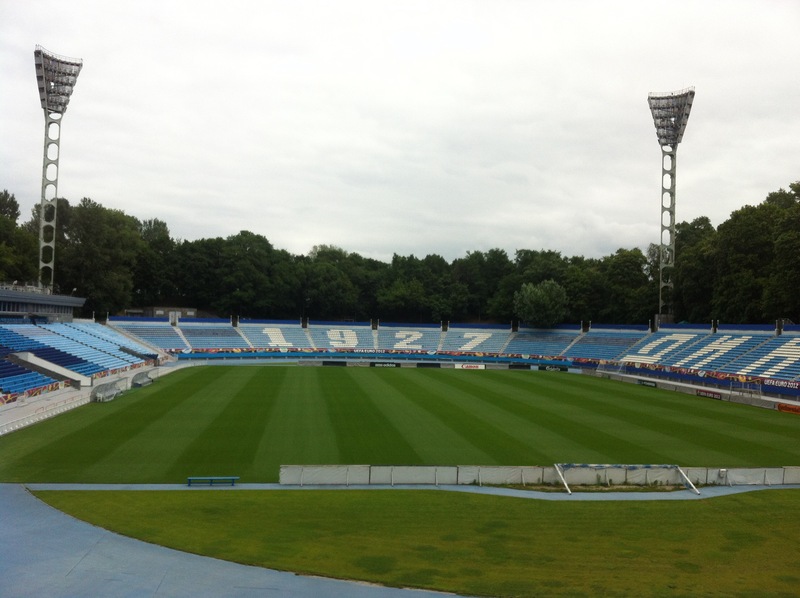 The Dynamo Kiev ground is in the middle of a park and is lined with lush sycamore and conker trees. It holds about 20,000 I would guess, and at the one end the numbers 1927 are picked out on the seats – a glorious sight for Cardiff fans who regard that year with reverential awe. In this setting, 600 or so fans, including 100 Taffies, braved torrential rain to cheer on the side. This was the first game I’ve been to where the coppers outnumbered the fans. There were about 1,000 of the unsmiling buggers there and they even hired a water cannon for the day. I can only think that this was some sort of Communist-era joke. Maybe our presence lifted the players because this was the best I’ve seen them play. We had an early rehearsal of Gwyr Harlech before the rain dampened our throats. Half the boys left for the pub at half-time cos it was wetter than the movie Perfect Storm and there was no cover. As for the game, our chaps have had some gyp from the fans for their appalling record and their stock is probably lower than American Samoa’s. But it won’t be long before they banish the bogey if they keep playing the way they did. We wuz robbed in terms of the general play. We dominated much of the second half, had stacks of corners and lacked only a good crosser of the ball. Their goal was a clear penalty. Jason Jones in goal, who had a good game, came for a ball he shouldn’t have and missed it by a split second. Top effort lads. Note to the FAW – can we play the next one in a ground with a covered stand please? Wales: Jones, Hillier, Price, Gabbidon, Day (c), Valentine (Slatter 65), S Thomas, Gibson, J Thomas (Tolley 65), Earnshaw, Maxwell (Williams 75). Layton Maxwell’s 20-yard rocket hit the bar and whacked Earnie, who’d been following up, on the forehead before our man could react. Rhys Day – Man City’s No 5. Could well end up with the big boys given the advancing years of our current centre-half options. Formed an excellent partnership with the nearly-as-good Gabbidon. Chester Hartley, eight, out here with his old man, Tim. Got a pudding bowl haircut and looks like Andy Legg’s Mini Me. Probably the youngest ever fan to watch the u21s abroad – when he’s older he’ll probably develop a complex about this. Da iawn bachgen. Was this the first instance of a Wales player doing the Ayatollah during the game? Probably should have scored in the first half. But he created his best chance himself so he was entitled to miss it. Excellent game. Needed better service and balls hit over the top of the defence. Suffered most from our biggest deficiency – the passing was mediocre. Walking out the stadium, I was soaked to the skin carrying a flag which weighs a ton because it mopped up half the rain in the stadium and I stupidly didn’t take it down. Joe Bloggski: Hey mister, you Cardiff City fan? JB (still shouting, jabbering excitedly): Oooooliga-a-a-a-a-a-a-ans here? JB (almost dribbling): Where oooooooolig-a-a-a-a-a-a-ans? Me (thinking ‘Jest effing eff off will you?’): Not here. JB: Swap shirt, mister. Where oooligans? Coming tomorrow?